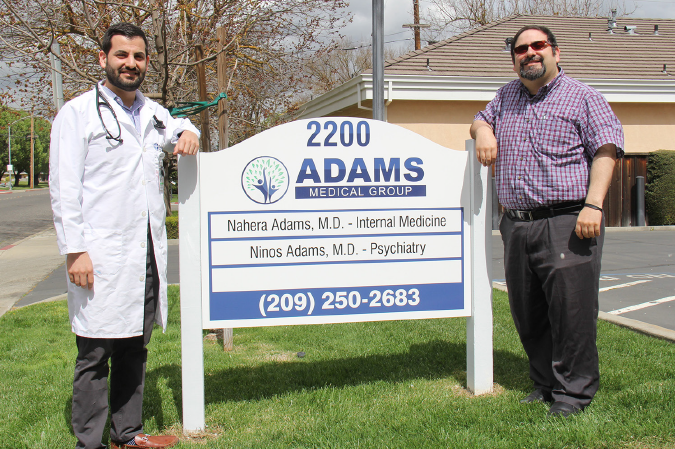 Doctors Nahera and Ninos Adams recently opened their own private practice in Turlock, Adams Medical Group, where Nahera will serve as a primary care physician and Ninos as Turlock’s lone psychiatrist. Throughout medical school at the University of California, Davis, Doctors Nahera Adams and Ninos Adams did everything together, earning themselves the nickname “The Brothers” amongst their peers. When completing their residency programs, however, the pair was split — Nahera continued his education in Internal Medicine at the University of California, San Francisco’s Fresno Medical Education Program, while Ninos excelled as chief resident for several years in the UCLA-Kern Psychiatry Residency Program. Today, the two brothers have been reunited, opening their own practice in Turlock during a time when a lack of physicians has forced Valley residents to wait weeks, or even months, for a visit to the doctor’s office. Born and raised in Modesto, Nahera and Ninos spent much of their youth working through weekends and summer vacations on their family’s almond orchard in Turlock and learning about the world of medicine from their father, who recently retired as an obstetrician-gynecologist after 40 years. Stanislaus County is home to them, the brothers said, and serving their community has been a goal years in the making. After completing his residency at UCSF Fresno, Nahera knew he wanted to provide care for the underserved Central Valley. He began working as a primary care physician at Sutter Gould in Turlock, but a retirement in town opened up a new window of opportunity. Dr. Vernon Park, one of just a few physicians in town who specialized in internal medicine, was officially shuttering his Turlock practice after 39 years in the field. Nahera jumped at the chance to purchase the office, taking over Dr. Park’s old clients and opening Adams Medical Group after quitting his job at Sutter Gould in October. Nahera invited his brother to join him in his practice, as Ninos would be the only psychiatrist in Turlock. He said that as a physician at Sutter Gould, he would typically have to refer patients to psychiatrists in Modesto, who would then have to wait four to six months for an appointment. With the Adams brothers in one office, now it will be almost as simple as walking across the hall for psychiatric patients to get the help they need. “It’s the perfect opportunity for us to be in the same office because so many of my patients will need his help,” Nahera said. While two more doctors in Turlock is definitely a bright spot in the city’s doctor woes, there’s still much work to be done to attract physicians to an area that is clearly lacking an adequate number both locally and throughout the state. According to a study by the California Future Health Workforce Commission, California faces a shortage of 4,100 primary care doctors in the next decade as more and more doctors reach retirement age, and too few sign up to take their place. More than one-third of the state’s health care professionals are over the age of 55, and in Turlock that statistic and its impact ring true. Along with Dr. Park, Turlock internists Dr. Mark Davenport and Dr. Edward Holm have recently retired, leaving just Nahera and two other primary care physicians with private practices in town. Turlock and the surrounding Central Valley are hit harder than other areas in the state by the doctor shortage. For example, the San Joaquin Valley has 39 primary care providers per every 100,000 residents, while Sacramento and the Bay Area have 54 and 64, respectively. In 2017, the Valley’s number was 48 physicians per 100,000. There is also a shortage of specialists, including psychiatrists like Ninos, who said he didn’t realize the severity of the problem in Turlock until he and his brother opened Adams Medical Group. While Nahera and Ninos are helping alleviate both the primary care provider and specialist shortage here in the Valley, they also address another need: medical practitioners who match the diversity of the Valley community. According to the CFHWC study, Latinos make up nearly 40 percent of the state population, yet only seven percent of doctors are Latino. Fewer than 20 percent of medical professionals speak Spanish. In addition to English, Nahera and Ninos both speak Assyrian and Spanish, and Ninos can also speak Farsi. Nahera explained that speaking the same language as a patient can help put them at ease, and often comes in handy in Turlock where the second-largest Assyrian-American community in the country and a large Latino population reside. “It definitely makes a big difference in how you can treat them. Even if you have an interpreter, they can’t explain everything, so without language the connection is lost between the doctor and the patient,” Nahera said. After completing their respective residency programs, both of which were located in the Central Valley, Nahera and Ninos said they felt prepared to treat such a diverse population. Many doctors who train in the Valley often choose to practice medicine in big cities rather than the small, rural center of the state, and the brothers said they would often try and recruit classmates to stay in the area, but to no avail. In order to attract doctors to the area, both Nahera and Ninos suggested the state move forward with establishing a medical school in the Valley and offer incentives for doctors who come and work here, like loan forgiveness. The CFHWC has proposed an elaborate plan to increase the number of health workers in the state by over 47,000, which includes tactics to recruit more students into health careers, funding more scholarships for students who commit to serving in rural communities, maximizing the roles of nurse practitioners and expanding residency programs for new doctors and psychiatrists, among others. As the problem grows both statewide and locally, all Nahera and Ninos can focus on is what they came to Turlock to do: giving the community the quality care they deserve. • Ensuring scope-of-practice regulations for NPs and PAs maximize their capacity to provide primary care and to work at the highest level of their education and knowledge. Information from UC San Francisco’s report “California’s Primary Care Workforce: Forecasted Supply, Demand, and Pipeline of Trainees, 2016-2030.